Tis the season to eat lamb! Falala, lala, la, la, la, laaaaa... Or perhaps it should be, Bababa, baba, ba, ba, ba, baaaa! Easter is just around the corner. Children everywhere are sporting conspicuous dye-stained fingers and carry the faint aroma of boiled eggs. Their schoolwork is distracted by daydreams of the sweet treats the Easter bunny will soon deliver. Adults are counting the days until they’re released from their Lenten resolutions. And my home smells of Marshmallow Peeps and Cadbury Cream Eggs. Traditionally, lamb and ham are popular selections for Easter dinner. For some people, Easter may be the one time a year they eat lamb. We are not those people. 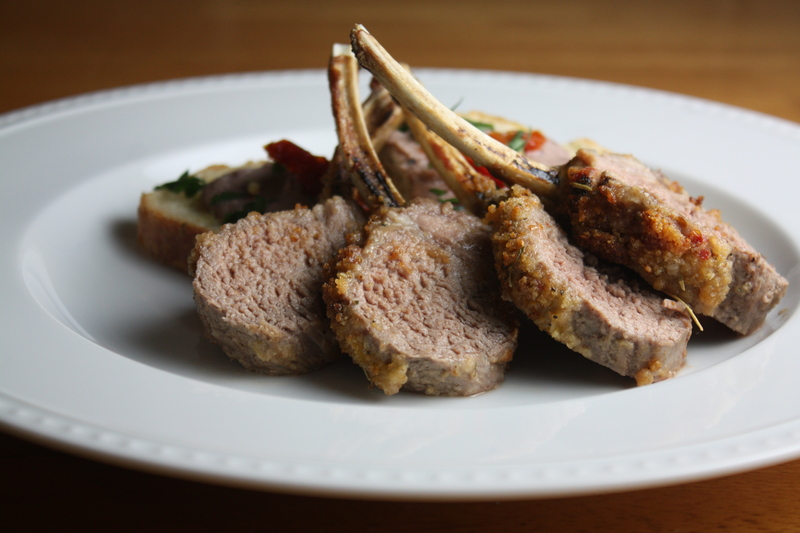 Around our home, lamb finds its way onto our menu on a semi-regular basis. We enjoy Greek-style lamb burgers with tzatziki sauce, shepherd’s pie, and roasted leg of lamb with fresh mint pesto. I even won a contest earlier in the year with a recipe for tender braised lamb shanks with brown-braised onions and mushrooms. I’m so sorry adorable little lambs, but we really do appreciate your delectable contribution to our dinner table! 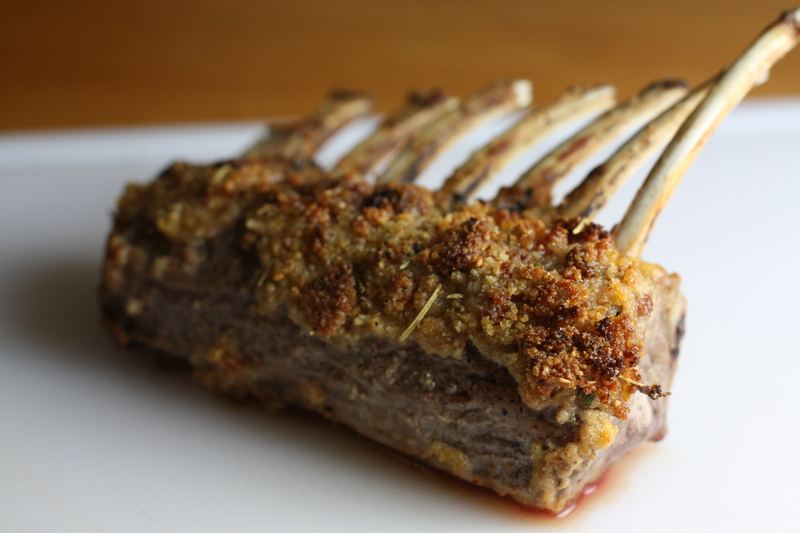 With Easter quickly approaching, I thought I’d share another lamb dish with you; a classic roasted rack of lamb, crusted with sweet roasted garlic, sun-dried tomatoes, and parmesan cheese. 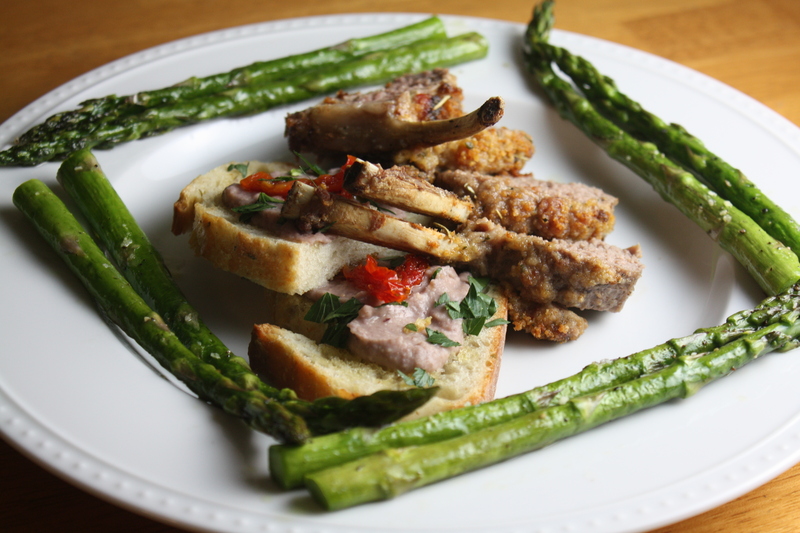 We’ll set our perfectly roasted lamb chops aside slices of toasted sourdough topped with a white bean and kalamata olive puree and a side of roasted asparagus. Sounds kinda fancy, right?? I promise you that it’s a cinch to make! The combination of naturally flavorful ingredients does the brunt of the work. You just need to do a little arranging and then sit back and take credit for this elegant spring meal! *Click here to see my photo guide on roasting garlic. Puree the beans, olives, and garlic using a blender, food processor, or immersion blender until smooth. Season with salt and pepper, as desired. Refrigerate until ready to use. To serve, spread each slice of sourdough with a generous amount of the bean puree and top with a few pieces of sun-dried tomatoes and a touch of fresh parsley. Leftover puree makes a delicious dip or spread on veggies or bread! Combine the bread crumbs, parmesan cheese, sun-dried tomatoes, roasted garlic, and rosemary. Drizzle with olive oil and stir until moist. The mixture will still be slightly crumbly. Season with salt and pepper, as desired. Set aside. Trim the lamb of any excess exterior fat or silver skin. Season with salt and pepper. Heat olive oil over medium heat in an oven safe pan. Place the lamb in the pan. 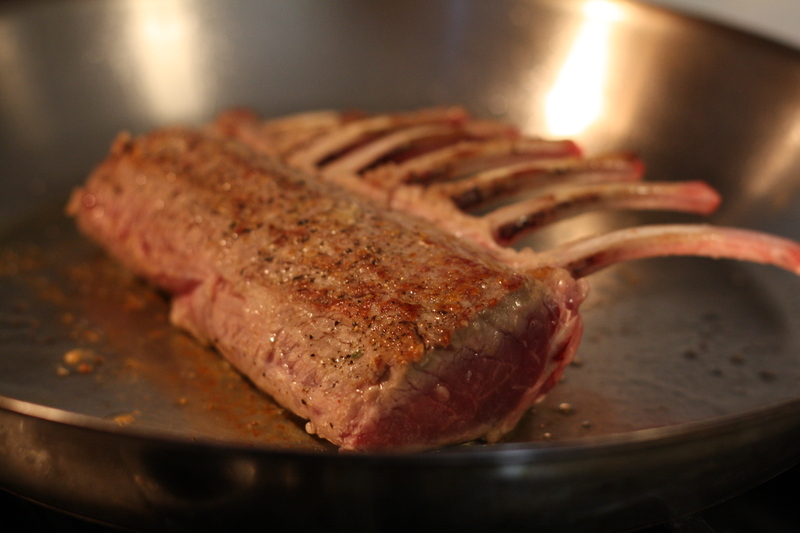 Cook the lamb for a minute or two on each side, until lightly browned. Rub the top side with the dijon mustard, then press the bread crumb mixture into the mustard. Place the pan in the oven. Cook for about 10 minutes. Reduce the heat to 375 degrees and cook for another 8-10 minutes for medium-rare/medium doneness. Rest for 10 minutes before slicing into chops. Preheat oven to 375 degrees. Rinse the asparagus and trim off the tough end. (A little trick for determining how much to cut is to hold one asparagus spear by the ends and bend. The point where the asparagus snaps is generally a good place to trim off.) 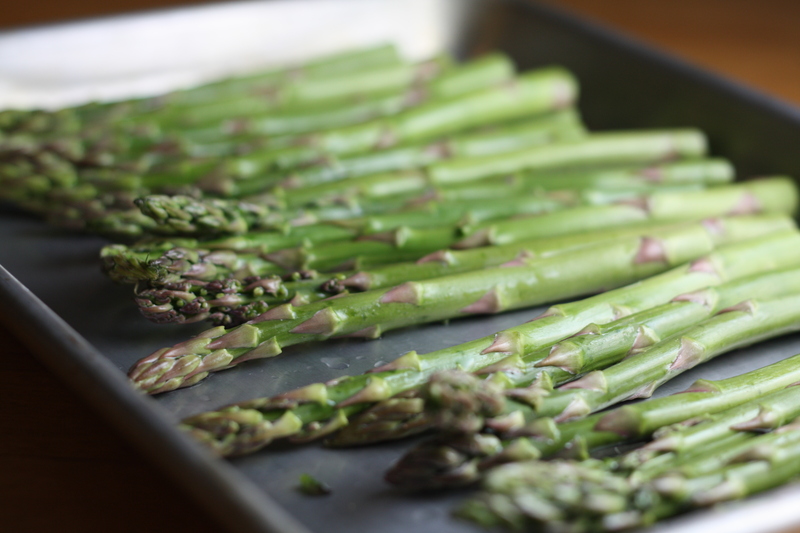 Toss the asparagus in a bit of olive oil and season with salt and pepper. Arrange the spears in a single layer on a baking sheet. Bake for 10-12 minutes. 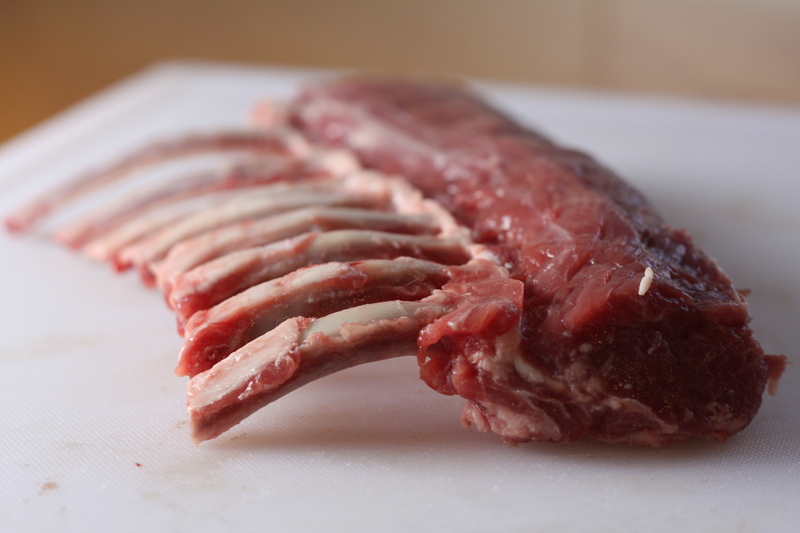 Prepare the white bean puree and crust mixture for the lamb ahead of time. Refrigerate until ready to use. Brush the sourdough slices with a bit of olive oil and place directly on an oven rack while the lamb is cooking. 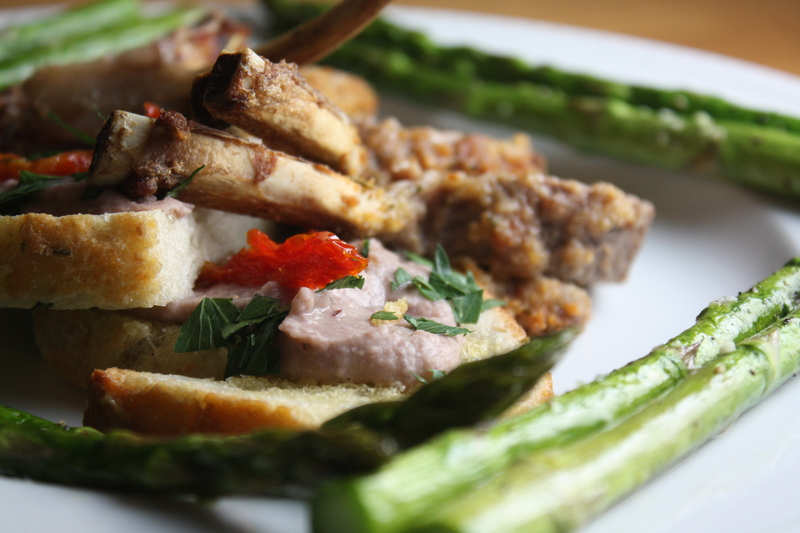 Once they’re toasted, you can prepare the bread with the white bean puree and sun-dried tomatoes while the lamb finishes. Place the asparagus into the oven during the last 5 minutes of the lamb’s cooking time. They will finish cooking as the lamb rests. Posted in Food, Lamb, Main Course, Recipes, Side Dishes, Vegetable and tagged appetizers, comfort food, Cooking, easter, family, Food, holidays, hors d'oeuvres, lamb, Recipes, side dish, vegetables. Bookmark the permalink. I made this yesterday for Easter dinner. Thank you so much for this wonderful recipe. Not only was it absolutely delicious but also very easy to prepare. My family couldn’t stop raving! I look forward to seeing more of your recipes!